I live in wiverton road and I would just like to warn neighbours about a fox who seems fearless. I have had a fox come into my house at least 3 times in the last 2 months. In the hot weather I had my back door open and found a leather shoe in the hall taken from 1st floor bedroom. I guessed it could be a fox but then another time I opened bathroom door and it was on the stairs with a shoe. I shouted at it and it just stared at me. Threw something at it and waved arms but it just strolled downstairs and out, dropping shoe in kitchen. Yesterday I was up the garden and had door open as I was outside and saw fox come round my shed and enter kitchen. I shouted and it just looked and carried on. While I was thinking on what to do it came out. Luckily my son was upstairs and scared it off . I do not feed foxes or encourage them and luckily I do not have small children but there are lots of families around here. I heard the Urban Fox society rep talking on LBC (Nick Ferrari) this morning: he said the worst thing to do is to feed foxes, which encourages them not to fear humans and then they're likely to come into your or a neighbour's house. Personally when they come into my garden I shout and chase them away every time I see them. A fox attacked a young girl in house in Bromley this/last week. They are becoming a real menace. Thanks for the warning, zara. They've been very audibly active the past few weeks. zara wrote: I live in wiverton road and I would just like to warn neighbours about a fox who seems fearless. I suspect you have encountered the fox my wife and I call GLF (Good Looking Fox, because a year ago he was a magnificent beast, although he got a bit tatty earlier this year when he had a family to support). His territory is around Newlands Park. He is completely relaxed around people to a degree I have seldom seen in a fox before. I would guess he was part domesticated as a cub. This is a recent picture of him. We're in that area and have lost a few items to foxes this summer. Also found them in the house... such a pain as shoes can no longer be dumped by the back door! They are as bold as brass. Perhaps he's one of those former fox cubs whose photos someone posted on here a few years back - wasn't someone or other feeding them back then? I cannot believe that people feed foxes - it’s like feeding rats or squirrels. They are disease carrying vermin. 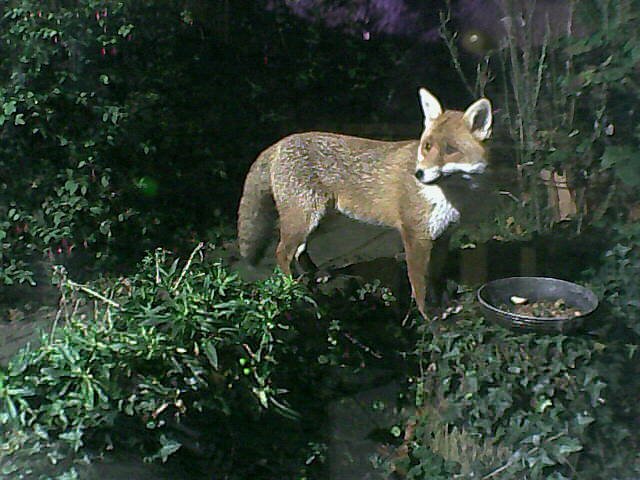 I saw a fox in the garden last summer. About 2 seconds before it was spotted by my (quite large) Jack Russell terrier. The fox managed to scramble under the fence and release itself from the dog which had it by the throat. I doubt it survived. The dog was pretty mental for a week afterwards. So, get a Jack Russell. (I did get the dog checked over by the vet afterwards and he gave him proplaxis for the various diseases carried by foxes). Filthy animals. In my boyhood in Somerset we used to hunt them with a pack of beagles. Great fun. Be careful around "fearless foxes", they may have mange which is infectious to people and dogs. Curiously,one of the symptoms of fox mange is that the fox loses its natural fear of humans. I had a mangy fox once take up residence in the outside cat box my semi feral cat lived in. Talk to a vet it can be treated ,ask vet how. Precautions needed. I have a soft spot for brer fox, they are first class at rat control, and carrion clear up, including all those deceased cats. A lot of what foxes get blamed for, at least in rural areas, is actually down to badgers. Only soft townies feed foxes.They are very good at surviving on their own. Only thing better than a good Jack Russell dog, is two good Jack Russell dogs. Contact the Fox Project, a very good charity who advise on everything foxy. I personally love the creatures and find them entertaining. I think the local vixen used to use our garden as a creche; one summer she had about 6 cubs with her bouncing around all over the place. While they looked cute we didn’t feed them and actively discouraged them. I did a bit of fox proofing having researched various methods which definitely cut down on fox action. The key, apparently, is to do several things at once to deter them and not just one thing. For example blocking up an easy way in along with some anti fox liquid stuff and maybe a movement activated water sprayer. It worked but this summer I haven’t done anything and have paid the price as foxes are creeping back in. I lost a new sandal to one the other week after it stole it from inside the house. About 10 years ago the same thing happened where I used to live with the fox being so brave it regularly explored the flat even getting locked in by mistake for a whole day. Around the same time I also woke up one night to find a fox paw next to my face. We used to sleep with the bedroom door open in the summer as we had a security gate on it but had to stop after that. And this week's News Shopper has as its front page headline a story about a child being bitten by a fox which got into the house in Petts Wood. You do need to be careful of the things, cute though they may be. But then I came across your thread. We do pest control in London, and I was based in Perry rise for many years. The issue is that a lot of clients contact us because of fox issues and there are not really any long term solution. Shooting, trapping and culling free the territory for another fox to move in eventually. I personally think that the best way to deal with foxes is to put a good fence to keep them out of the affected area, or to make sure that in your garden there is not a suitable area where they could build a burrow or that the domestic rubbish is kept into a sealed container. In any case, I would really like to contribute to the fox project charity as a separate incentive http://foxproject.org.uk/ I was also in the past considering to do something similar with a bee charity but never got round to it. But is never too late to do good work. I just contacted foxproject.org.uk by email to offer them our support.